This is a different kind of post for the GMC. First of all, the only music I can find that features the spotlighted performer is on a video. But it’s also different because I’m going to give you the basics, but then point you toward a couple of other places that do a much better job of telling the whole story of this fascinating lady. Viola Smith, once known as the ‘Female Gene Krupa’, started her career way back in the 1930s — and amazingly, she’s now 102 years old and still doing just fine. Her story began in 1912 when she was born Viola Schmitz in Mount Calvary, Wisconsin. Her father owned a restaurant and dance hall, and made sure his eight daughters all learned to play musical instruments so that he could mold them into a band. For some of them — especially Viola — it was the beginning of a career as professional musicians. 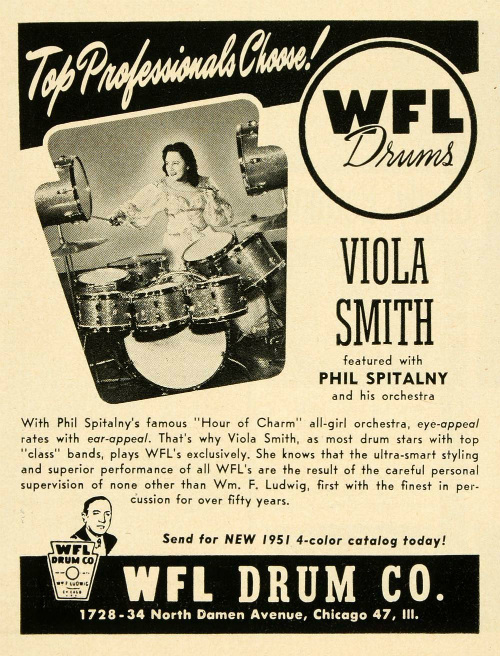 Before she finally retired from the business, Viola would become a vital part of some of the ‘all-girl’ bands that toured America in the 1930s and 1940s, would appear on radio and TV, and would be a member of the original Kit-Kat band in the famous Broadway musical, Cabaret. And that’s just the tip of the iceberg for the lady who was known as one of the best ever. At last report, Viola was happily retired and living in Costa Mesa, California, surrounded by friends and family. Viola Smith! What a great post. I hope you are well. We are getting the snow we missed last week. It’s here overnight and tomorrow. Thanks, but I can’t take too much credit for the post. She’s pretty inspiring and I just wanted people to know about her. PS we dodged most of the bad weather. What a great entertainer! Thanks for sharing. Here’s another link I found that shows her with friends and family.